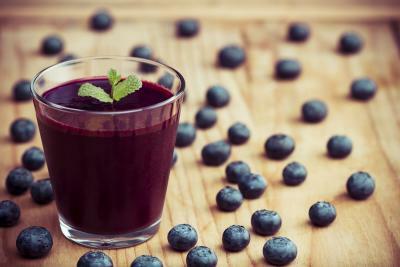 Blueberry juice is delicious and promotes liver health. Your liver is a hard-working, multitasking organ. It removes waste and toxins from your blood, produces a digestive liquid called bile and stores sugar in the form of glycogen, to name a few. If you're interested in adding drinks to your diet that promote liver health, you have a few to choose from. Consult your physician before taking any drinks classified as supplements. Talk to your doctor first if you have liver problems or take medication that affects liver function. The journal "PLOS One" published an animal study in March 2013 evaluating the effects of blueberry juice on liver fibrosis, which is scarring that occurs from liver disease. Researchers fed blueberry juice to rats with liver fibrosis for eight weeks. At the end of the trial, they found the blueberry juice helped counteract liver fibrosis by increasing protective proteins and improving the liver's ability to handle oxidative stress, which occurs when unstable molecules called free radicals damage cells. Blood orange juice protects the liver against fat accumulation, according to an animal experiment in the "World Journal of Gastroenterology" published in August 2012. Researchers fed the mice a high-fat diet to cause obesity, then fed them blood orange juice for 12 weeks. Blood orange juice protected against fatty liver, reduced weight gain, lowered total cholesterol and triglycerides, and increased insulin sensitivity, according to the study. Insulin is a hormone that regulates blood sugar. Noni, known botanically as Morinda citrifolia, is a tropical fruit-bearing plant. In the United States, noni is commercially available in the form of a juice supplement found primarily at health food stores. Some preparations combine noni with other juices, such as grape. The journal "Plant Foods and Human Nutrition" published an animal study in June 2008 concluding that noni juice may help to protect the liver from damage caused by exposure to toxins. Watch out for added sugars in fruit juices. Look for varieties with minimal or no sugar added and check the juice content. Some brands of blueberry juice, for example, contain only a small amount of real juice. Choose brands labeled 100 percent juice when possible. Keep in mind juice is an extra source of calories and lacks the fiber found in whole fruits. If you plan to juice your own fruit, know that blood oranges are a seasonal variety available from January through mid-April.